Grow your business and revenue faster. Send potential candidates and clients the right message with new audience views tailored to them. Add a new, fully customizable Contact Us module on your page that now collects contact info from potential clients to help grow your business. Solidify your company’s credibility with dual testimonial sections – one for candidates that you’ve helped place and one for business clients that you’ve helped find candidates for. Candidates familiar with your company are 2.5 times more likely to respond to your InMail messages. 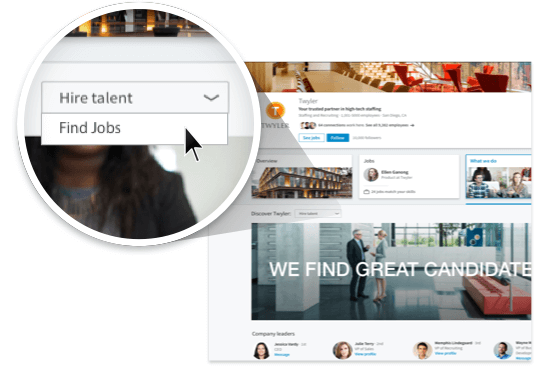 Increase response rates and boost engagement by driving more applicants through your Career Page. Ready to catch more prospective candidates and clients? Upgrade your Career Page today.